I have always wanted to be a DJ. Many of my friends have picked up on this dream of mine by now. Thus, it was certainly no surprise when I decided to play a few tunes at a friend’s dinner party recently. I was able to play a few good songs right from my iPhone — however, since my 60GB iPod recently took a long nap, I do not have a great selection of music on my phone. As I started to run out of dinner-party music, I switched over to the Pandora app on my iPhone. I’ve had it for a few months, but it was the first time I’ve actually used the app. I truly think that this type of marketing activity is wonderful. Certainly, technology makes it very easy for Pandora to know who is using their iPhone App. They also will know how often they use it. Their approach of sending this message a few minutes after I signed off left quite an impression on me. Pandora delivered great tunes to me at the dinner party, and thus, was fresh in my mind. Now, I was certainly more apt to click the links in their email than if I had simply received this email during normal work hours, for example. When it comes to marketing your product or service, find ways to identify specific times and occasions where your company will be the freshest in the minds of your customers and prospects. Regardless if they are having a good or bad experience, you may be able to capitalize on the moment by reaching out to them during that “hot” time-period. While they may not necessarily take any further action at that moment, you will certainly increase your changes of leaving an impression on them. This is interesting. 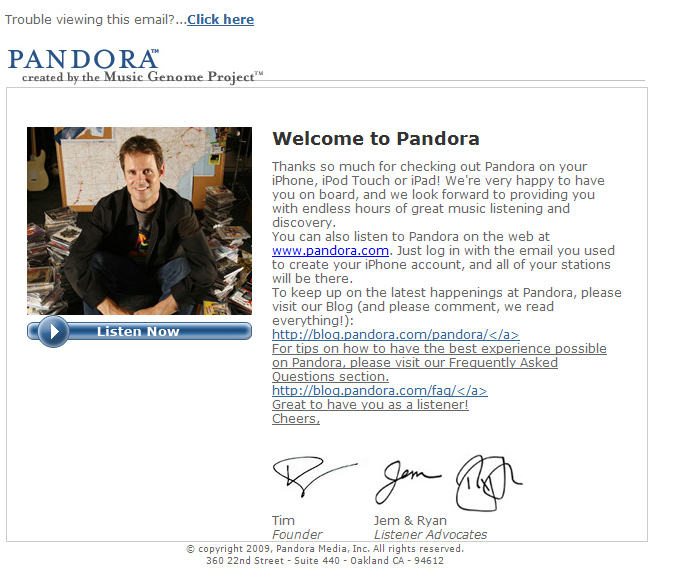 I downloaded the Pandora app about six months ago and did not get an awesome response email like you did (jealous! ), so they are clearly ramping up their marketing integration. A great example to follow. But I greatly appreciate your comment! Fantastic post, I prefer wireless headphones myself.